By now, most Edgefield County residents are at least familiar with the concept of a rodeo. And many even know a thing or two about cutting horses. But, how about the equine sport of sorting? This growing activity is taking root on the Westside where, aside from recurring practices at Braxton Training Center, two sorting competitions are scheduled in the next few weeks. The training complex, located on the back side of Recoletta Ranch on Red Hill Road, will host sorting events Oct. 19 and Nov. 23. 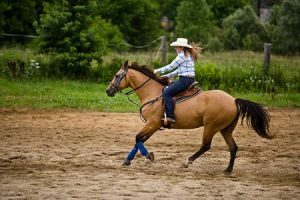 Participants from all over the southeast are expect to converge on the spot to compete for the coveted saddle and belt buckle to be award to the winners of the 2 series event. So what exactly is sorting? Well, while its name seems pretty self-explanatory, it is a little more complicated than sorting the black cows from the brown cows. According, to Eddie Braxton, owner of the training center, in sorting, 10 cows numbered from 0-9 are sorted between 2 round pens that are connected by a gate in the middle. Sounds simple, right? Did I mention the cows have to be sorted in the correct numerical order and in 1 minute? If you have ever worked with a cow, you know they are not exactly known for their speed or willingness to cooperate. Sorting may not be familiar to many of our residents, but for those in the know about cutting horses, the name Eddie Braxton probably is. That is because Braxton is a National Cutting Horse Association Hall of Fame member. The Florida native, along with his wife, Tracy, moved to the Westside ranch nearly 4 years ago to setup their equine center to train and show horses. In that short amount of time, his sorting competitions have become so popular that an estimated 150 teams competed in their last event. And Braxton has hopes that the sport will continue to grow and catch on in the community. In fact, to encourage interest in the sport, sorting events at the center are free to the public. Braxton said, “I want everybody to come and get interested in it.” So if you are looking for some good horsing around, come watch the cowboys sort it all out this weekend at the Braxton Training Center.